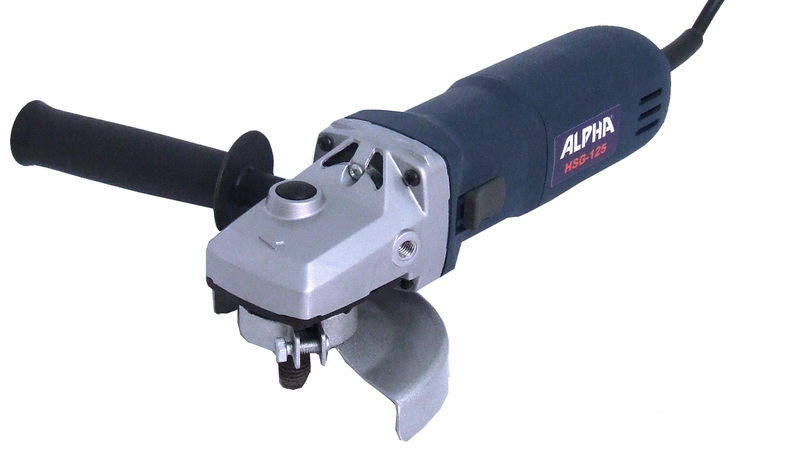 Alpha Professional Tools¬ is proud to introduce a new HSG-125 High-speed Angle Grinder. This 5î grinder has a powerful 7.2 Amp (800W) motor with 9,700 rpm. The HSG-125 is equipped with a standard 5/8î spindle and two sets of flange/lock nut sets (7/8î and 20mm arbors) in order to accommodate 4î, 4-1/2î and 5î diameter blades. The new Alpha¬ HSG-125 is versatile and can be used wet or dry. Use the HSG-125 as a dry application, and combine the grinder with the optional, Alpha¬ Ecoguard system, to create a dust-free operation eliminating unnecessary cleanup. The Ecoguard comes in two types: Type C for cutting or Type G for grinding. It can also be equipped with the optional Alpha¬ Universal Safety Guard Kit (GCWKIT), for use with an Alpha¬ Groove Cutter for wet applications. The Alpha¬ HSG-125 is more than just a grinder, it is the ultimate workhorse for Stone Fabricators and Tile installers!